Alan has practised yoga for twenty five years and has the British Wheel of Yoga Teaching Diploma and is a member of the Register of Exercise Professionals UK / Europe. Alan has taught in London City YMCA, Thanet District Council, Mid Kent College Medway and in many local venues. Alan has completed four London Marathons and the Great North Run in the last eight years. He would like to see a variety of sportsmen and women using yoga to enhance their ability to perform in their field. Yoga has the ability to loosen tight muscles, strengthen weak backs and de-stress the most complex of minds. Alan has practiced his yoga under the guidance of Mira Mehta a renowned Iyengar yoga teacher and author. He has also studied Yoga Therapy (Remedial Yoga) with Mira in London. Glenys has practised yoga for some thirty years and is a passionate and experienced Hatha Yoga teacher. She has the British Wheel of Yoga Teaching Diploma and is a member of the Register of Exercise Professionals UK / Europe. Glenys has taught students from the very young to those in their eighties. She believes yoga can help everyone to live well, feel good and age gracefully. Glenys was a primary teacher by profession and holds the National Professional Qualification for Head Teachers and has brought her experience of yoga into the classroom. She has been invited to teach yoga in both primary and secondary schools. Glenys gained her qualification to teach yoga to children with Jo Manuel who is the Director of 'The Special Yoga Centre', London. Jo is a leading exponent in teaching yoga to children with special needs. Glenys is also qualified to teach Yoga for Pregnancy, Postnatal and Baby Yoga and Yoga for Cancer patients. Alan and Glenys have taught Yoga to groups recovering from substance misuse and mental health concerns. 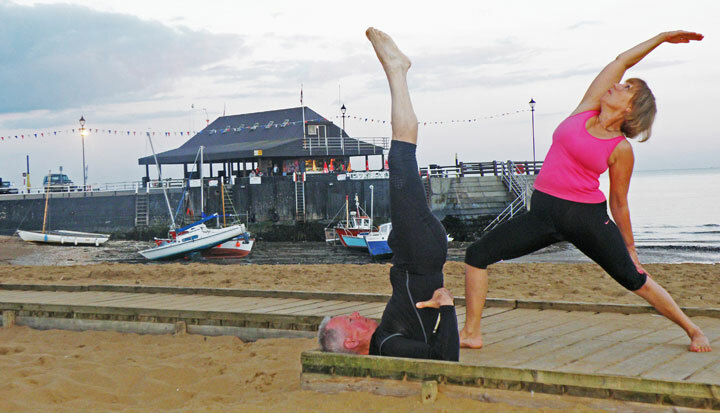 Glenys and Alan are co-founders and directors of Yoga�is and both teach regular classes at the studio.